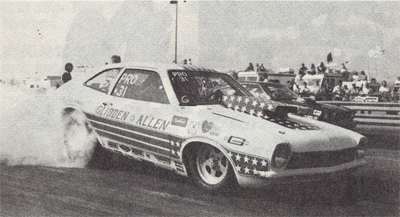 Reserved for North American built cars with North American automobile engines with a wheelbase of 100 inches or more and for American sub-compacts – AMX, Colt, Cricket, Gremlin, Pinto, Vega, Astra, etc. – with North American engines with a minimum wheelbase of 94 inches. Body, engine, drive train, chassis, etc., may not be altered, modified or relocated, except as outlined in Class Requirements. Push starts not permitted, according to www.glass.net. One class of competition for non-supercharged cars. Class is determined by total car weight, including driver, divided by total cubic inches engine displacement. The use of big block motors – over 366 cubic inches original production – is not allowed in cars having 100 inch wheelbase or less. BALLAST: Permitted. May not be visible in passenger compartment. Shotbags must be contained in accepted weight-box. See Safety Regulations, Ballast. BATTERY: Trunk installation permitted. Two maximum. Total weight wet and fully charged, including battery box: 100 pounds. BRAKES: Four-wheel brakes mandatory. All brake lines must be out of the flywheel and drive line area. BUMPERS: Stock or fiberglass duplicates required front and rear and may be molded into body. CARBURETION: Limited to two 4-bbl or four 2-bbl American automotive carburetors with any internal modifications. Fuel iniectors not allowed. DOORS: All doors must be functional and operable from inside or outside. DRIVER: Must be in stock location. Revision of seat location prohibited. No part of the driver’s seat may extend behind the “B-Post.” All drivers must wear full trousers and jackets. ENGINE: Must be of 1965 or later manufacture and must be same make as car. Any internal modifications permitted. EXHAUST SYSTEM: Open exhaust with headers, permitted. Tailpipes and/or mufflers optional. FENOER SPLASH PANS: Front. Must be retained, cannot be removed, but can be trimmed to allow a maximum of 2 inch clearance around headers. The use of aluminum or fiberglass for fender splash pans is allowed. FIREWALL: Moving the stock firewall rearward for engine installation permitted. Replacing the stock unit witti one of .028 inch steel allowed. FLOORS: Replacing the stock floors with .028 inch steel allowed. Any floor that has been replaced must be in stock location and stock appearing. Subfloors and/or bellypans are prohibited. Chassis/Frame and drive line must be below floor. Transmission cover and rear floor behind “B-Post” may be made of aluminum. Minimum thickness .040 inch. Rear floor may not be higher than 8 inches above the door sill. Drive line tunnel behind driver’s seat may be higher if necessary for proper clearance. FLYWHEEL SHIELD: SEMA 6-l flywheel shield required on all cars except those equipped with pre-1961 Hydramatic transmissions. Minimum requirement for all other automatic transmissions is an accepted flexible blanket shield. See Safety Regulations’ Flywheel Shields. FUEL SYSIEM: Stock type fuel tank must be used. lf the gas tank filler neck is moved into the trunk, the tank must have a pressure cap. The tank must be vented to the outside of the body. The trunk must then be completely separated from the driver’s compartment with a firewall of flameproof material. Extra tank(s) not permitted. Safety fuel cells highly recommended. Fuel blocks accepted. See Safety Regulations, Fuel Systems. FRAME: Frame from radiator to rear of car may be replaced. Any properly reinforced frame accepted. Additional members may be added for strength and/or roll cage installation. GRILLE: Grilles must be full stock production for body used and must be visible from front, may have coverlng over back or grllle to prevent air from passing through. Required, all classes. HOOD SCOOP: Permitted, however hood scoops other than ones produced as factorv equipment for the specific model and year of car may not extend more than 7 inches above the height of the original hood’s surface, as measured from the base of the hood scoop for cars with a wheelbase of 100 inches or more. Maximum height is 5 inches on any car with a wheelbase less than 100 inches. All scoops must be finished and painted to follow the body paint scheme and must be part of the hood. Hood must be stock size, cowl section may be molded to hood. RADIATOR: Full size stock radiator in stock front location with stock-type water Pump required. REAR END: Stock type rear end required. Full floating units are recommended. ROLL CAGE: Required. May be constructed of SAE 4130 Chrome Moly steel or 1% inch X .095 inch dimensions. All welding must be done by approved Heliarc process. Additional frame strengthening members must be of same dimensions and welding as roll cage. Cages/Frames of non-ferrous or exotic metals, aluminum, magnesium, titanium, etc., not allowed. See Safety Regulations, Roll Cage. SAFETY BELT & SHOULDER HARNESS: Required. It is mandatory that a five point or inverted ‘V’ belt be used. See Safety Regulations. SPOILERS: All rear spoilers other than those originally factory installed on bodv used must not be more than four inches high and must be mounted behind the rear axle. Roof mounted spoilers other than original for body used not permitted. No air foils allowed. Any rear spoiler must be integrated into the overall body design and must be painted to match the body color scheme. Any front spoiler used must have been factory available for car body used. Minimum ground clearance for front spoiler, 3 inches and must be solidly braced to prevent deflection. STEERING: Stock type steering located in the conventional front location required. Minimum steering wheel diameter – center to center – 13 inches. STREET EQUIPMENT: Complete, functional, stock seal beam headlight units are mandatory. Any other street equipment which does not affect the external appearance may be removed except tail lights. Side marker lights optional. lt is recommended that tail lights be operational. SUSPENSION: Full automobile production-type systems must be used and be equipped with at least one hydraulic shock absorber per wheel. Fabricated units permitted however excessive lightening of stock components is prohibited. Rigid-mounted suspensions or straight front axles are not allowed. TIRES: Slicks permitted. Treadless front tires built for racing purposes only are permitted. Clearance from outside of front tire to inside of fender at closest point not to exceed 4 inches. Rear clearance 1″ from outside of tire to inside of fender at closest point. TRACTION BARS: Traction bars or similar devices used to transmit rear axle torque to the frame, thus preventing violent rear spring wind-up under acceleration or deceleration, are considered safety equipment and are therefore highly recommended. However, units must not be longer in overall length than one-half the wheelbase of the car. Traction bars and/or mounting brackets to the rear axle housing must not be lower than the lowest edge of the rear wheel rim. TRANSMISSION: Any transmission acceptable with forward and reverse gears. Transmissions must in conventional location, determined by engine used. UPHOLSTERY: Full interior trim must be retained equivalent to factory specifications. Bucket seats may replace stock seats (two required) only if they are fully upholstered and full size automotive type seats. Dashboard exterior appearance must be retained. Gauges may be painted in – simulated. See Safety Regulations, Seats & Upholstery. WARM-UPS: Due to specialty transmissions having no neutral gear it will be mandatory that a driver be seated in the car in the normal driving position any time the engine is running. WEIGHT MINIMUMS: All cars with small block engines = 2,250 pounds. All cars with big block engines: 2,450 pounds. These weight minimums are including driver. WHEELBASE: All cars must retain stock wheelbase length for car body used. All cars may not have a wheelbase variance from left to right of more than one inch. Body to wheelbase measurements must be within 1 inch of factory average measurements. WHEELWELLS: Rear. Must be seperate for each tire. 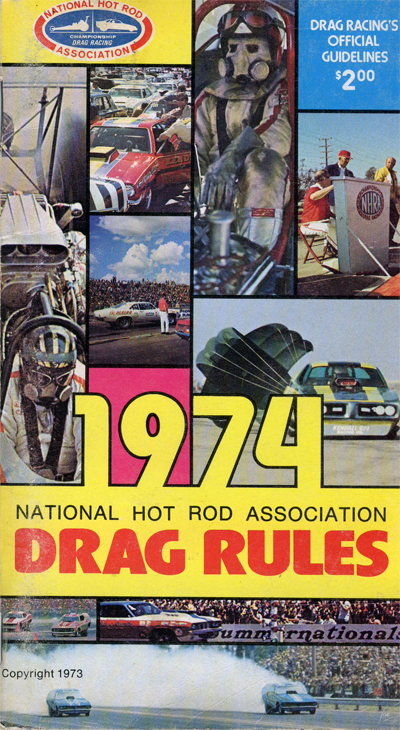 Below lie the complete set of rules for Pro Stock Eliminator in the year 1974. One of the key parts of these rules is the factoring numbers that are near the top of the rules. It was this factoring by NHRA that would lead directly to the development of the vehicle known as the ‘Taxi’. Reserved for North American built cars with North American automobile engines with a wheelbase of 100 inches or more and for American sub-compacts – AMX, Colt, Cricket, Gremlin, Pinto or Vega – with North American engines with a minimum wheelbase of 94 inches. Body, engine, drive train, chassis, etc., may not be altered, modified or relocated, except as outlined in Class Requirements. Push starts not permitted. One class of competition for non-supercharged cars. Class is determined by total car weight divided by total cubic inches engine displacement. 6.45 or more lbs. per cubic inch, for cars with 105 inch or more wheelbase using true wedge or incline valve engines of original production. 6.65 or more lbs. per cubic inch, for cars under 105 inch wheelbase using true wedge engines of 366 cubic inches or less, original production. 6.75 or more lbs. per cubic inch, for cars under 105 inch wheelbase using incline valve engines of 366 cubic inches or less, original production. 7.00 or more lbs. per cubic inch, for cars over 100 inch wheelbase using all other engines, i.e., Hemi’s, Cammers, etc. The use of big block motors is not allowed in cars having 100-inch wheelbase or less. Displacement/weight ratios and other class requirements subject to re-evaluation March 18, 1974. BODY: Must be a 1969 or later model/year factory produced coupe, sedan or station wagon. Sports Cars, Sedan Deliveries and Trucks not permitted. Original steel body shell must be retained. Chopping, channeling, sectioning or other body alterations as to contour or length is prohibited. The use of fiberglass or other lightweight components is restrict o hood, front fenders, splash pans, valance panels and rear deck lid, however, they must be exact duplicates of stock components replaced. Lift-off hoods and deck lids permitted. Excessive weight reduction of bodies or body parts is not permitted. Roll cages mandatory. Any under the hood modification necessary for engine installation will be allowed. See Firewall. BUMPERS: Stock or exactly fiberglass duplicates required front and rear. CARBURETION: Limited to two 4-bbl or 4 2-bbl American automotive carburetors with any internal modifications. Fuel injectors not allowed. DRIVER: Must be in stock location. Revision of seat location prohibited. No part of the driver may extend behind the “B-Post.” All drivers must wear full trousers and jackets. ENGINE SET BACK: Permitted, provided that the front spark plug hole is not behind the front spindle. FENDER SPLASH PANS: Must be retained, cannot be removed but can be trimmed to fallow a maximum of 2 inch clearance around headers. The use of aluminum or fiberglass for fender splash pans is allowed. FIREWALL: Moving the stock firewall rearward for engine installation permitted. Replacing the stock unit with one .028 steel allowed. FLOORS: Replacing the stock floors with .028 inch steel allowed. Any floor that has been replaced must e in stock location and stock appearing. Sub-floor and/or bellypans are not allowed. FLYWHEEL SHIELD: SEMA 6-1 flywheel shield required on all cars except those equipped with pre-1961 Hydramatic transmissions. Minimum requirement for all other automatic transmissions is an acceptable flexible blanket shield. See Safety Regulations, Flywheel Shields. FUEL SYSTEM: Original stock type fuel tank must be used. lf filler neck is relocated to the trunk the tank must have a pressure cap and tank must be vented to the outside of the body. Trunks must then be completely isolated from the driver’s and passenger compartment with a suitable firewall of flameproof material. Accessory tank(s) not permitted. Fuel blocks acceptable. See Safety Regulations, Fuel Systems. FRAME: Must be stock automobile frame for car body used. Properly reinforced stepped frames accepted. Cross members may not be altered or relocated except as required for engine or transmission swaps. Additional members may be added for strength for roll cage installation. Front frame “horns” may be replaced with rectangular steel tubing that is equal to, or heavier than stock members. Round tubing is not permitted. See Roll Cage. HOOD SCOOP: Permitted, however hood scoops other than ones produced as factory equipment for the specific model and year may not extend more than 7 inches above the height of the hood’s surface, as measured from the base of the hood scoop for cars with a wheelbase of 100 inches or more. Maximum height is 5 inches on any car with a wheelbase less than 100 inches. All scoops must be finished and match body paint scheme. ROLL CAGE: Required. May be constructed of SAE 4130 Chrome Moly steel or 1 5/8 inch X .095 inch dimensions. All welding must be done by approved Halyard process. Additional frame strengthening members must be of same dimensions and welding as roll cage. Cages/Frames of non-ferrous or exotic metals, aluminum, magnesium, titanium, etc., not allowed. SAFETY BELT & SHOULOER HARNESS: Required, It is highly recommended that a five point or inverted ‘V’ belt be used. SPOILERS: All rear spoilers other than those originally factory installed on body used must not be more than four inches high and must be mounted behind the rear axle. Roof mounted spoilers other than original for body used not permitted. No air foils allowed. Any rear spoiler must be integrated into the overall body design and be painted to match the body color scheme. Minimum ground clearance for front spoiler, 3 inches. STREET EQUIPMENT: Complete, functional, stock seal beam head- light units are mandatory. Any other street equipment, which does not affect the external appearance, may be removed except taillights. SUSPENSION: Full production-type systems must be used and be equipped with at least one hydraulic shock absorber per wheel. Fabricated units permitted however excessive lightening of stock components is prohibited. Rigid-mounted suspensions or straight front axles is not allowed. TIRES: Slicks permitted. Rear tire tread may not exceed two inches outside the rear and rear fenders must retain the original contours. Treadless front tires built for racing purposes only are permitted. TRACTION BARS: Traction bars or similar devices used to transmit torque to the frame, thus preventing violent rear spring wind-up under acceleration or deceleration, are considered safety equipment and are therefore highly recommended. However, units must not be longer in overall length than one-half the wheelbase of the car. Traction bars and/or mounting brackets to the rear axle housing must not be lower than the lowest edge of the rear wheel rim. TRANSMISSION: Any transmission acceptable with forward and reverse gears. Transmission must remain in conventional location, determined by engine used. Manual clutch automatic transmissions are permitted. UPHOLSTERY: Full interior trim must be retained equivalent to factory specifications. Bucket seats may replace stock seats (two required) only if they are fully upholstered and full size automotive type seats. Dashboard exterior appearance must be retained. WEIGHT MINIMUMS: All cars with 6.45, 6.65 & 6.75 factors = 2,100 pounds. Cars with 7.00 factors = 2,300 pounds. WHEELBASE: All cars must retain stock wheelbase, length and tread width for car body used. All Pro class cars may not have a wheelbase variance from left to right of more than one inch. Body to wheelbase measurements must be within 1 inch of factory average measurements. WINDSHIELD/WINDOWS: Full safety glass required. No Plexiglas or other lightweight components. All windshields and windows must be clear except for factory-tinted safety glass. Identification decals not permitted on front door window or windshield. Windows must be closed; windows need not be operative. 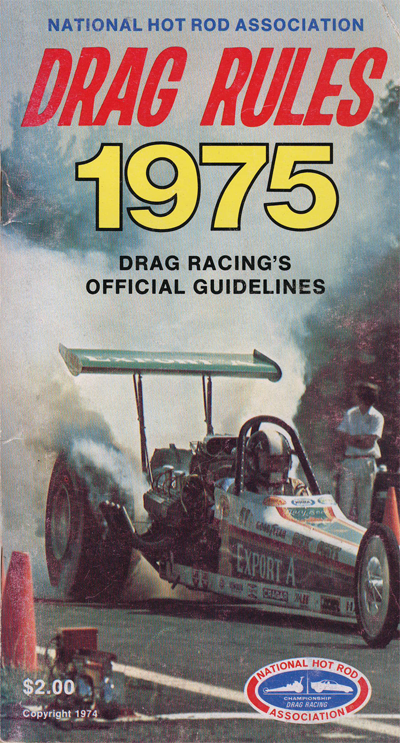 NHRA 1973 Drag Rules. Pretty cool. 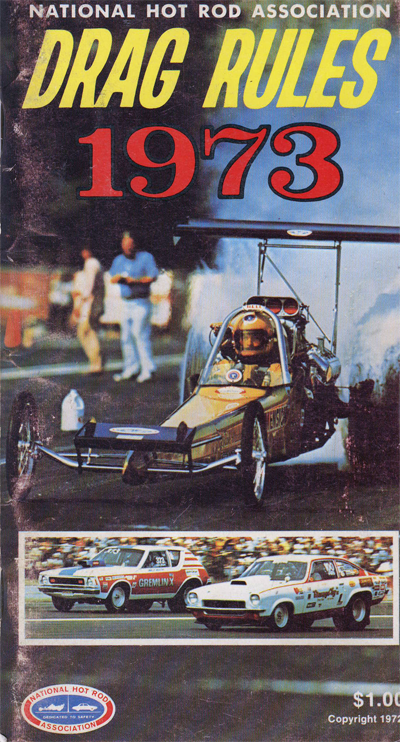 I’ve got the ’74 and ’75 books as well.